It’s Christmas! It’s the first year that DD has really grasped the concept and for the last two weeks she’s talked of little else than Père Noël (Father Christmas) – when will he come, how does he get in, will she hear or see him, etc. It’s wonderful. This time last year we were crammed into a tiny gite that was barely habitable during the winter. In hindsight we were stupid to stay there at all. DD had only started at the school a few weeks before so although we went along to the Fête de Noël (a band and a buvette) and the party for the children (lots of cake and an incredibly tedious story teller!) our language skills weren’t all that and it was difficult to know what was going on. We didn’t really have the internet and we weren’t feeling all that Christmassy. Plus the weather was better. This year we’re much more settled into daily life – and with worse weather it somehow feels more like Christmas. Maybe that’s how it will always be for the Brit abroad at this time of year. Christmas just doesn’t happen here like in the UK, not out here in the sticks anyway. Yes, there’s a Christmas aisle at the supermarche, but it’s nothing like the barrage of festivity that you get in the UK. If you go to a Christmas market of course, Christmas is on, obviously, but otherwise, apart from the appearance of the Christmas markets, the brass bands that play there, there’s not much to know it was Christmas. It’s quite nice. I get the impression that Christmas here is much less about shopping and more about spending time with family and friends. I may be wrong, but I’m not feeling any of that sense of pressure to spend, to shop, to provide, that I used to get in England. And because we generally have less to do anyway we’ve been able to make time (and in doing so, save money) making presents and cards when maybe in the UK we’d have just bought them without thinking so much. 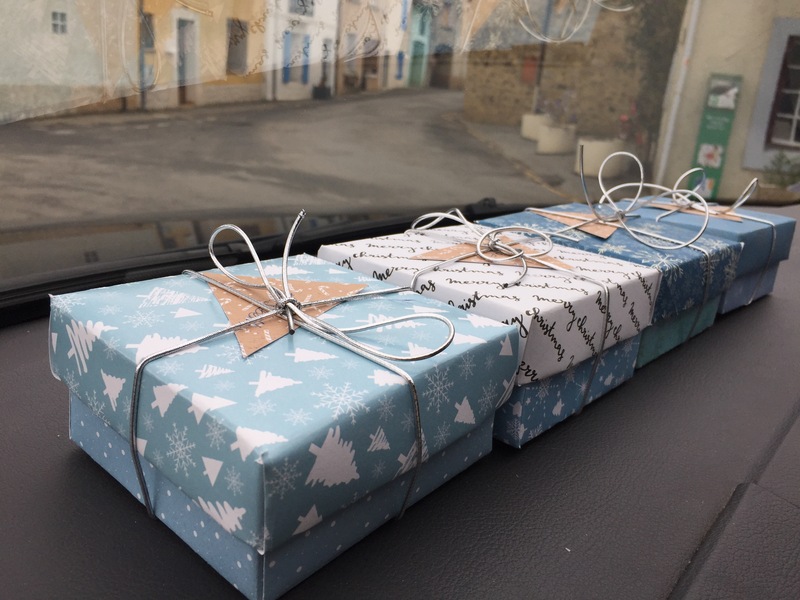 I made mince pies for the teachers and then, because I couldn’t find a way to package them (or anything to package them in that didn’t cost a bomb) we made some pretty gift boxes using some fabulous card and the instructions on this other blog. They came our really well! Likewise, cards. A charity pack of five cards was going to cost 8 euros, so we made those too. As far as lunch goes, we’re staying at home, cooking a chicken big enough to feed the four of us, going out for a walk while it cooks, then curling up by the fire to watch a film. Simple. And no Christmas TV, which is the scourge of Christmases at my parent’s house! James took DD to the park while DS slept and I managed to get everything wrapped and ready. That worked really well, much better than leaving it to the last minute then sitting up until 1am, trying to stealth wrap, because DD won’t go to sleep – which is what happened last year. We’re ready! Something to wear, Something to share. Something to read, something you need. But then what would Santa bring? So I’ve outsourced the Something You Want to Santa, who they’ve been told brings only one present. That works fine. I like the idea of them having a shared present. I like that they’re not expecting Santa to fill the house to the rooftop with everything they want (DD has quite a list!) Otherwise we buy something they want and then Santa brings something else on top. That’s just too many presents in terms of both expense and clutter. I had planned to put a tub of Playdoh or something crafty in each one too but I ran out of time. I think they have enough stuff anyway so am happy that I didn’t manage to get more. They also get new pyjamas. I would have given them those this evening, by way of encouraging them into bed, but DS had been running a temperature for the last two nights so sending him to bed in super-fluffy winter jammies was not the best idea! Luckily DD didn’t need any encouraging. They can have them tomorrow instead. On the festivities front, DD has been learning some French Christmas songs at school so we’ve been listening to them on Spotify so she can teach us and so we can learn a few more. Our favourite album (of the weekend, at least) is French Christmas Carols (The Best Christmas Songs) by the French Young Singers. It’s really fun trying to sing along and to learn the lyrics of these new songs. Even if the tune is familiar because the language moves differently, they’re not so easy to sing! It’s interesting just how different the songs are despite having identical tunes. For example, vive le vent, which is sung to the tune of Jingle Bells (learn the lyrics here), is all about the wind and the weather – no bells or reindeer anywhere! I suppose the other way around the French will be surprised to know that we don’t have sing about the wind in our version 🙂 Most of the traditional English carols and Christmas songs have French equivalents – so there are many to learn. As far as that one goes, I rather like the French version: it’s romantic than. I like the idea of generations connected by memories carried on the winter wind. And with that thought it’s time for bed. Night night. And Joyeux Noël ! Our first summer in France and also, because DD is at the maternelle rather than at nursery, our first year without any childcare all summer meaning we have a full 8 weeks to occupy DD. Eight whole weeks? Yikes! It’s exciting yes, but daunting too. I doubt I’d be nearly so daunted if we were still at our old place near Manchester. There was sooooo much to do there. We were close to so many places running child-friendly activities – whether they were small business, community run projects – and of course I also had all my friends around me, many of whom had children of a similar age and would also be swashing around at a loose end for the entirety of the summer holiday. There’s plenty to do here you could say and you’d be right but we’re on a tight budget now and many of the places to visit – castles, animal parks, and the like – are aimed at tourists and are expensive – which makes them out of reach except for maybe one or two days of the holiday. There’s plenty to do outdoors here, yes: the usual, walking, cycling, etc. plus water sports, etc. But my children are 3.5 and 1.5 years old. They can’t do the same things. They don’t have any sense when it comes to being in the sun. They can’t swim. Or ride bikes. They prefer to run in opposite directions, especially where water’s involved. They play together, just, but not for long. More often than not there’s screaming, given that the DD is at an age where she’s starting to create things that are meaningful, develop stories, be interested in projects, while the younger one is now totally mobile and is happiest when taking things apart and chucking them either down the stairs or over his shoulder. You can see how these two interests aren’t mutually compatible. And there’s no backup. The grandparents are staying firmly put in the UK this summer. We don’t have any visitors, as we hadn’t moved into a proper rental house when people were starting to make summer holiday plans. So no friends are visiting, which is a shame. I was thinking to go back to the UK for a week (or more) but it’s high season so prices are high and after last time (I went on my own with the two smalls) the idea of it made me want to lie down! which means I’ve decided to put that off until later in the year. plan activities like messy play, crafts, etc. Enjoy them, they’re only young for a short time. Yeah, yeah. Something to remember when DS has just destroyed the train track that DD has spent the last 20 minutes constructing and they’re locked into a scream-in-your-face battle. Practical advice this is not! Feeling at a loss I made a timetable and printed it out – thinking I could work with that three blocks every day thing. It looked like this. When I started splitting the columns into three it became a tangled mess of boxes – all empty. I was starting to panic just looking at it. I tried to allocate activities to days with the day-into-thirds rule in mind but kept coming back to the fact that planning anything with a one-year-old and a three-year-old is as good as impossible, especially weeks in advance. The idea of having a timetable was itself stressing me out. The whole idea of having a holiday is to relax and not be rushing around or overcommitting to things. Plus it’s impossible to buy anything you actually need in France, so that ruled out pretty much any activity that needed supplies. Pinterest-inspired mummy I am not! So the calendar had to go. Both those reads helped to put me at ease. With those principles in mind I could handle it, for sure! This all means that as far as holiday planning goes, the plan is to play it by ear depending on how well we’ve all slept, what sort of mood we’re all in (not always sleep dependent!) and the weather, of course. My loose “schedule” – which is really just a bunch of things we might want to do – looks like this. Note: This post contains affiliate links. These are to books I’ve read that I recommend. I hope you don’t mind me including them. It’s a long weekend here in France, as with much of Europe (I think), made longer for the us by the fact that DD came back from school on Friday with suspected conjunctivitis (joy of joys) so we’ve been busying ourselves in the garden. Today we worked on our new compositing solution, which I plan to blog about once we’ve finished setting it up, and also caught up with our lovely neighbours Patrick and Claudine, who took us around their veggie patch and orchard and gave us some of the many lettuces they’ve started in their cold frame, as they’re now ready to plant out and they have loads of them. 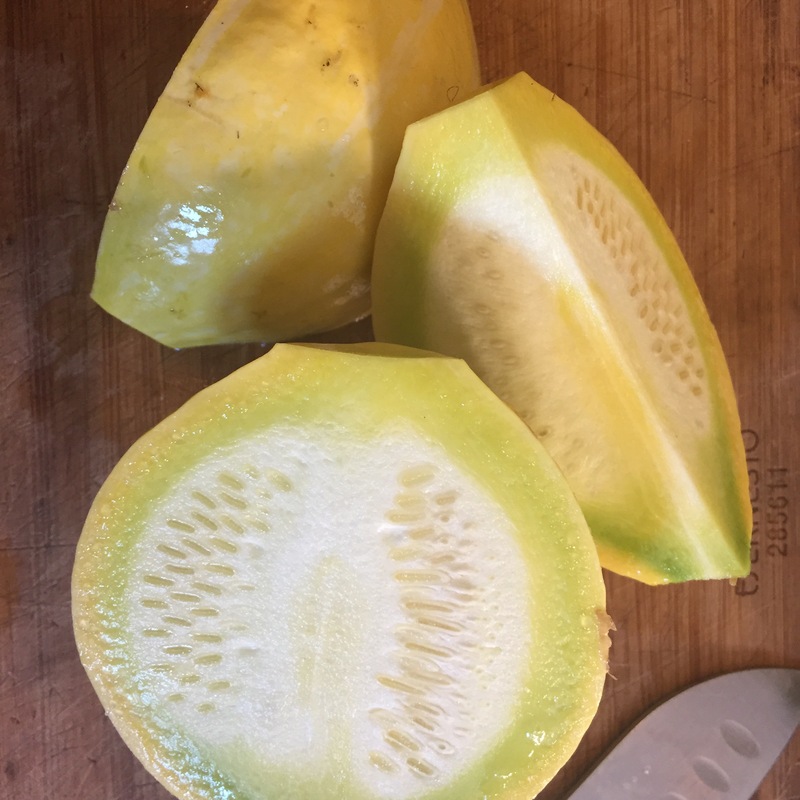 These are the sucrine variety, or Little Gem en anglais, apparently native to this part of the world and a really good grower in this climate. They have a wonderful garden which they work hard at maintaining. They know what they’re doing and have been giving us some good advice with our little patch, which is more than welcome. 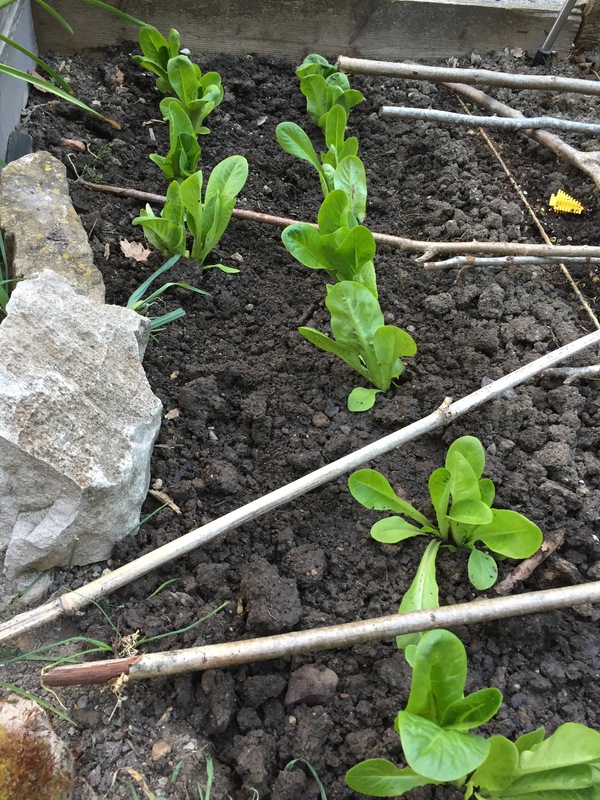 While we’ve gardened before and grown veg the climate is very different. They’re keen for us to succeed, which is lovely, and happy to also share their produce as well as their knowledge! Rhubarb is one of my favourite fruits (edible plants, actually) so when Claudine showed me their well-established patch I was more than happy to take up her offer of a large bunch to take home. Claudine and I were also able to clear up the main difference between jam and compote, so now I know (it’s do with the amount of sugar used and the length of time you plan to store it.) Her recommendation for rhubarb was very definitely rhubarb tart. 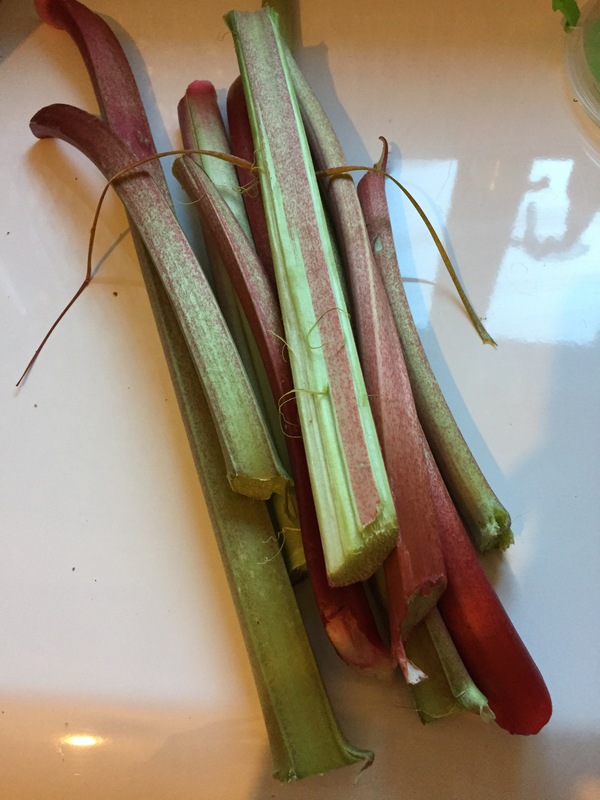 Now to find some sugar-free rhubarb recipes, which will be new territory as my preferred dishes are usually fairly sugar-dense, like stewed rhubarb crumble and custard. Can I find a passable rhubarb tart recipe that will be up to Claudine’s standards, I wonder?